Kristy Giteau is more used to being asked about her brother's sporting career than her own, but if Australia do well at the Women's Rugby World Cup next month all that could change. The sister of Wallabies star Matt, was a relative latecomer to rugby union, having taken up the sport just five years ago, but with a sporting pedigree that had already seen her represent Australia, once she took up the game she was always likely to rise to the top. The Tuggeranong Vikings club winger, has previously represented her country in rugby league while also touring China and the USA with the Australian schoolgirls basketball team. She explains: "Rugby league was my first contact sport back in 2000. My Dad was roped into coaching the local team and he wanted some speed out wide so brought me along with him. I played for three years and it was a great experience but I guess union had more of a pull on me because its so diverse in its reach and there were more international opportunities. "I grew up watching my three brothers playing but I really only took rugby up socially. I played for a while and then I went to Canada to travel for a time and when I came back I got back into it mainly because I missed my buddies. I managed to make the state team and then the nationals and then I was selected in the squad to play Samoa which was our World Cup qualifier." Australia were comfortable winners in that game and it was then that Kristy really tapped into her brother's experience. "When I found out I was in the team to play Samoa I called him up and his advice was to not let it overwhelm me because if you do it takes away from your natural game so I thought about how fortunate I was to be there and was glad to be able to ask someone so experienced at a time like that." Australia are coming to the World Cup with less games under their belts in the past year than any other team at the competition. It's a far from ideal situation but Giteau says the Wallaroos have made the best of it. "We have a central strength and conditioning coach and the ARU oversees our training in each region. We don't get much time together as a squad at all but this year by the time we go to London we'll have had three camps as a squad. The camp before we leave we'll be using to work on our game play and really just building the camaraderie in the squad as much as anything. "It's true that we don't play many games as a team, but I would say that the standard of the game domestically here is very high and getting better all the time. The state teams are very competitive and though we don't have those central opportunities to get together, the teams we are playing on are very strong and are of a high intensity." Australia haven't been dormant on the international scene since the last World Cup having played New Zealand four times and of course they reached huge heights last year when winning the IRB's first ever Women's Sevens World Cup. Giteau says that success on the 7s circuit has boosted confidence. "We're coming to the World Cup without as many games as the other teams but thats the way the cookie crumbles and we have to be positive about our chances. There is a real hunger for success at the 15aside World Cup after the 7s World Cup victory last year and more than anything we want to improve on how we did four years ago. "The 7s success and the fact that a lot of those girls are in the World Cup squad going to London is a big bonus for us as squad and it means that a lot of our backs especially know each other very well and have played together plenty. A lot of us were at the Hong Kong 7s so there is a lot of togetherness in how we attack." Australia's players she says are also well aware of how tough their competition will be at the pool stages of the competition. "Our coaches have been updating us all year with how the other teams are preparing especially the other three teams in our pool. We are well aware of how tough a pool we are in and we're not going in there blind." While all of Australia's games will be tough, their match against New Zealand will be one of the highlights of the pool stages. The two countries are fierce rivals in every sport and though Australia have never beaten their neighbours at the 15aside game, they got one over the Kiwisl at the 7s World Cup. While the focus for the next few weeks will solely be on rugby with the squad meeting at the Australian Institute of Sport for a week before leaving for the World Cup, Giteau is looking forward to visiting London as much as anything else. "Like lots of the girls in the squad I've never been to Europe so I'm really looking forward to it and hopefully we get some sights in as well." 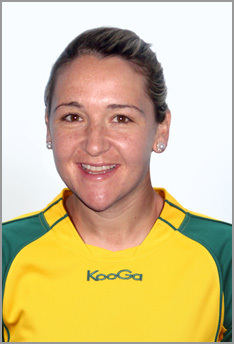 If Australia can transfer their 7s success to the 15 aside game, then Giteau's team may well see one significant sight - her country lifting two World Cups in as many years.